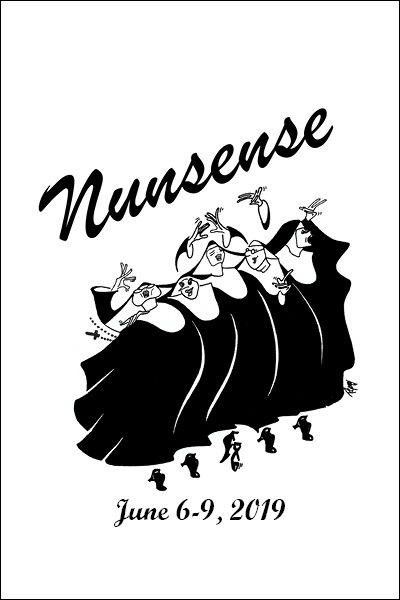 This show follows the Little Sisters of Hoboken, who find themselves in a financial panic when the convent cook inadvertently poisons 52 sisters. To raise the funds for their internment, the remaining sisters put on a variety show. This multi-award winning musical, including Best Off-Broadway Musical, has become an international phenomenon." Mother Superior, overweight, outrageous, quick-witted, knows how to get a laugh, tries to convince you that she is strict, but everyone knows that her “bark is worse than her bite”, Vocal range: F(3)-D(5) Mezzo or Alto range, Jazz/Swing style. Kind, always tries to be understanding and diplomatic, teaches the Novices the ground rules, and is supposed to be dignified - but with the slightest bit of encouragement, she is ready to kick up her heels, Vocal range: F(3)-C(5) Mezzo or Alto range, Gospel style. A tough streetwise nun who has a heart of gold, adored by kids because she speaks their language, a constant source of aggravation for Mother Superior, Vocal range: F#(3)-F(5) Mezzo or Alto range, Show Belter/ballad styles. The picture of innocence, lost her memory when a crucifix fell on her head, can't remember her past, and so she looks at each day with a childlike joy, has a puppet alter ego named Sister Mary Annette (ventriloquism and puppet experience are a plus but not required), Vocal range: G(3)-D(6) High Soprano range, Broadway and Country style. A former professional dancer, always eager to display her talent, impressionable, entered the convent to become the first ballerina nun. Please bring a headshot (or recent picture we can keep), resume (if you have a performance resume), and sheet music to your audition. Be prepared to sing 16-32 bars of a song in the style of the show for which you are auditioning. If you have one, please also bring an alternate song with sheet music (in a contrasting style or tempo). If you are asked to return for callbacks, please bring dance shoes and wear clothes you are comfortable moving in. Additional auditions and/or callbacks may be scheduled as needed.